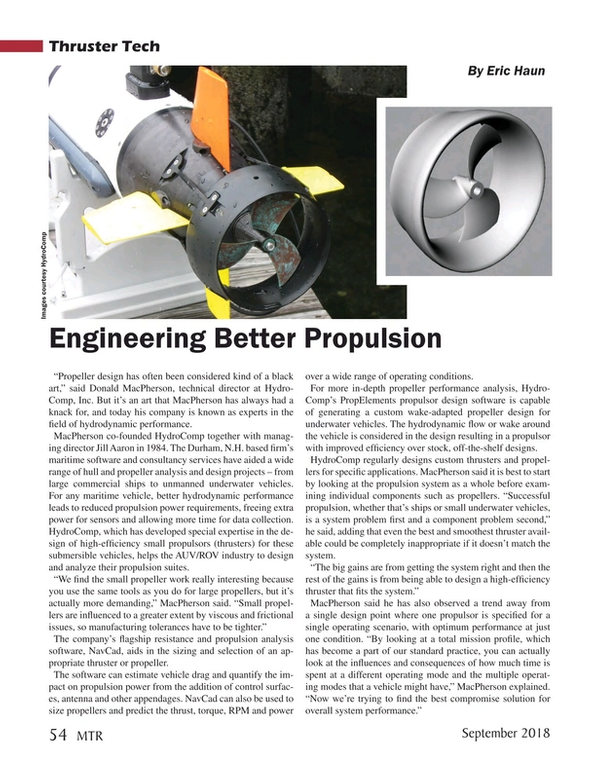 “Propeller design has often been considered kind of a black art,” said Donald MacPherson, technical director at HydroComp, Inc. But it’s an art that MacPherson has always had a knack for, and today his company is known as experts in the field of hydrodynamic performance. MacPherson co-founded HydroComp together with managing director Jill Aaron in 1984. The Durham, N.H. based firm’s maritime software and consultancy services have aided a wide range of hull and propeller analysis and design projects – from large commercial ships to unmanned underwater vehicles. For any maritime vehicle, better hydrodynamic performance leads to reduced propulsion power requirements, freeing extra power for sensors and allowing more time for data collection. HydroComp, which has developed special expertise in the design of high-efficiency small propulsors (thrusters) for these submersible vehicles, helps the AUV/ROV industry to design and analyze their propulsion suites. The company’s flagship resistance and propulsion analysis software, NavCad, aids in the sizing and selection of an appropriate thruster or propeller. The software can estimate vehicle drag and quantify the impact on propulsion power from the addition of control surfaces, antenna and other appendages. NavCad can also be used to size propellers and predict the thrust, torque, RPM and power over a wide range of operating conditions. For more in-depth propeller performance analysis, HydroComp’s PropElements propulsor design software is capable of generating a custom wake-adapted propeller design for underwater vehicles. The hydrodynamic flow or wake around the vehicle is considered in the design resulting in a propulsor with improved efficiency over stock, off-the-shelf designs. HydroComp regularly designs custom thrusters and propellers for specific applications. MacPherson said it is best to start by looking at the propulsion system as a whole before examining individual components such as propellers. “Successful propulsion, whether that’s ships or small underwater vehicles, is a system problem first and a component problem second,” he said, adding that even the best and smoothest thruster available could be completely inappropriate if it doesn’t match the system.